This year Razz and I decided to take 4 weeks off from our lovely part of the coast to do "The Western Run" in Queensland. I thought I'd share some of the valuable and interesting information with you all in case anyone is adventurous and wishes to travel out west. Our travels started at Taroom, then Roma, Mitchell, Charleville and Miles. For all of these shows you need to book early for stables and camping as space is limited at some showgrounds. Taroom has reasonable sized stables but I wouldn't recommend them for a horse that is not used to be stabled or reasonably quiet. There is access to electricity and showers and toilets close to stables. The show ring is watered although it has furrows in it, so be careful. We did our show hunter hacks under lights Sunday night which was nice considering the temperature during the day which was very hot. I was proud to win Smartest of Parade out of all the Show Hunter ponies, galloways, and hacks. I certainly had some competition. Except for the show ring, the outside ground was hard due to lack of rain. You could work your horses in the rodeo arena, but with 4 x white socks at times that became more of an effort than it was worth. Noone is allowed into the show ring to work or ride a horse unless they are being judged on show day. 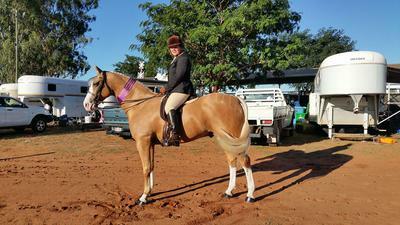 The Qld Show Jumping Championships were held at this show. Roma was the next show on the list. This show is quite a large show and is particularly well supported by show jumpers. They have a good program to suit a large variety of breeds, open hacks and show hunters. At Roma the newer stables are Race horse size, very safe, and made my 15.3hd warmblood look like a pony. The older ones are quite small. There is plenty of space to work your horse outside the show ring or on the race track and the ground is sand based so even though it isn't green it is soft. There are showers and toilets in the camp area and electricity to plug into. Roma is a great country town with everything you need. Feed was easy to get and you must go to the local bakery - YUM. A must see is the drapery in the main street. It has been in the fellow's family for years - just go and have a look. I can't describe the floor to ceiling and wall to wall materials you will find. AMAZING... The main cattle sales are held in the largest cattle saleyards in the Sthn Hemisphere on a Tuesday. Mitchell - only about an hr from Roma. There are showers and toilets in the camp area as well as electricity. My greatest fear was the design of the stables. I believed them to be very unsafe - good for hanging horses around the head and breaking legs. Put it this way - Razz spent the day tied to my float as it was safer.I put up rugs around the sides to help with safety. The show ring is green and watered, the outside is very very hard and dry so be careful working horses on the ground. The Mitchell pub had a wet dog inside behind the bar and a horse with its head, neck and two front feet inside another bar at night...so I guess anything goes in Mitchell. Charleville - We stayed a few days in Charleville. The stables here were 4m x 4m and lined with conveyor belt rubber. What a relief after Mitchell! There were showers and toilets near the stables and electricity. There was plenty of room to work your horse on the soft green grass of the show ring anytime you liked. The ground outside was hard and of course RED. Great for white socks! I was also able to let Razz into a safe small grassy paddock for a few hours. Well, I thought he would just eat- but he ran, rolled, pranced, kicked up, chased and ran around me the whole time playing. It is so important to remember to give them time just to be a horse. He was so happy after his free time. It was also easy to get feed in Charleville. The races are also on along with a night rodeo the show weekend so there is a lot to do. Charleville has the Cosmos centre, so make sure you go and look at the planets and stars with their big telescopes ($28 adult). They also have a great historical house in town to go and look at for $7.00.The bakery is also great and does a good coffee. It is also a tradition for everyone stabled and camping to be asked to go out for dinner on the Wed night which I did. It was a lovely night and we all met each other over dinner. The Police in Charleville take their jobs seriously - so just be careful. I was breathalysed twice in 3 days....Lucky I'm not a drinker! On the way toward home we had a long drive of about 6 hrs to Miles. Miles stables are two rails around - some are bigger than others. There are clean showers and toilets and electricity beside the stables. The show ring was very uneven and hard in places. They have water restrictions and had trouble getting the ring to a good standard for the show. I found it very difficult to run on let alone ride on. The outside ground is hard dirt. There was a sand arena you could use, but it was very deep and I decided not to use it. The people I met from Mitchell were lovely and couldn't do enough to offer to help you out. Miles has a fantastic historical village you must see. It was just incredible the effort the town has put into re-creating this past era. I spent hours there. After Miles, some went onto Chinchilla for their show which was only 45kms away. Razz and I had had enough Mother and Son bonding, so we headed home. Most of the travelling on the road was good. Good sections of the road were 110kms/hr. I only travelled during the day - not on dusk nor dawn and I wouldn't recommend it unless you want to wear road kill. Lots of kangaroos met their match on the road. I had aircon/heater in my float, tv, fridge, and a comfy bed all of which I was grateful for. I am also grateful for having a very sound horse who travels extremely well, and eats and drinks everything. He is also very used to being in a stable anywhere and trusts that his Mum is not far away. Razzy was just as happy drinking the artesian water. From Mitchell west you have artesian water everywhere. It is treated, but if you are fussy like me I had 100lt of tank water to drink under the float. I kept the water for drinking and had showers in the facilities at the different grounds. We had a great trip that was very successful also in the show ring. There are not many coloured horses shown out that way so you tend to stand out in the crowd. Most horses are stock horses, with very few QH types to be seen. Most kids were on galloways and horses and not ponies which was interesting. I made lots of new friends some of whom I am still in contact with. It was an experience I thoroughly enjoyed. My advice is to plan your trip, book early, and always put your horse first. Give them a break if you need to travelling. Look at the ground first before you work your horse on it - remember, you want him safe and sound for 3 or so weeks and not all grounds were horse "sound" friendly. I wouldn't take a fussy eater or drinker, or a horse that tended to sometimes get a little sore on this trip. Thanks for the write up on your travels out West :) Interesting reading and a wealth of tips and advice.